Love the celebration of Valentine’s Day this year with a Valentine gift that is certain to be treasured by both the recipient and their kitty! Share your love and devotion with a Valentine gift that contains a kitty toy for fluffy and treats and sweets for your Valentine. A soft plush teddy bear is certain to seal the deal with his/her “Be Mine” heart. 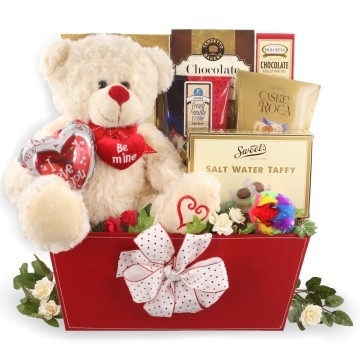 Share your love this Valentine’s Day with a specialty Valentine’s Day gift basket. Salt Water Taffy Chocolate Chiffon 2 oz.